"The Christlike quality of meekness often is misunderstood in our contemporary world. 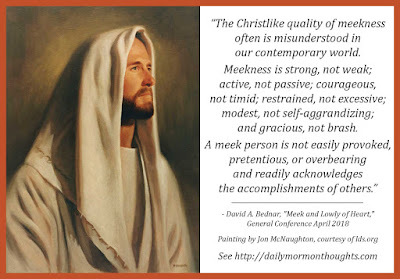 Meekness is strong, not weak; active, not passive; courageous, not timid; restrained, not excessive; modest, not self-aggrandizing; and gracious, not brash. A meek person is not easily provoked, pretentious, or overbearing and readily acknowledges the accomplishments of others. "Whereas humility generally denotes dependence upon God and the constant need for His guidance and support, a distinguishing characteristic of meekness is a particular spiritual receptivity to learning both from the Holy Ghost and from people who may seem less capable, experienced, or educated, who may not hold important positions, or who otherwise may not appear to have much to contribute. Recall how Naaman, captain of the king’s army in Syria, overcame his pride and meekly accepted the advice of his servants to obey Elisha the prophet and wash in the river Jordan seven times (see 2 Kings 5:1–17). Meekness is the principal protection from the prideful blindness that often arises from prominence, position, power, wealth, and adulation." 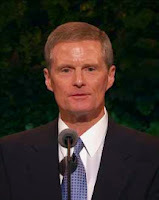 Elder Bednar taught about the "Christlike quality of meekness" using scriptural and contemporary examples. These paragraphs summarize some of the qualities he describes. Quite different from the prevailing concept held by the world, meekness includes "righteous responsiveness, willing submissiveness, and strong self-restraint." Those are interesting descriptions to ponder: am I responsive to righteous instructions and spiritual promptings? Am I willing to submit to God and to others who could bless me with their influence? Can I restrain and control my desires and actions in appropriate ways? While humility and meekness are both very desirable qualities we are encouraged to develop, they have different focuses. According to Elder Bednar, humility relates more to our relationship to God, and our recognition of the guidance and support He offers. But meekness usually describes a willingness to learn from either the Holy Ghost or from other people around us, including those who may seem to us to be "less capable, experienced, or educated, who may not hold important positions, or who otherwise may not appear to have much to contribute." A truly meek person recognizes the good in all, and knows that he can learn from every person, no matter their stature or position. How important it is to be wary of "the prideful blindness that often arises from prominence, position, power, wealth, and adulation." Great counsel for us all!